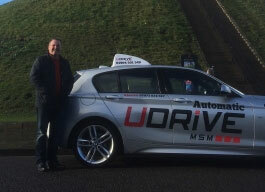 I am looking forward to working with UDRIVE in and around the York Hull and The East Riding of Yorkshire I am delighted to offer tuition in a high specification BMW 4-wheel drive with many enhanced safety features. Formerly a serving Police officer with both West Yorkshire Police and British Transport Police Most recent years have been spent with in the Aviation Industry and latterly as a helicopter pilot and instructor I’ve lived in the East Riding for over 20 years and in my spare time I enjoy motorcycling and walking in the local countryside with my wife and two dogs. I have been driving cars and motorcycles for 37 years and I am passionate about sharing my skills and expertise in teaching learners of all ages and temperaments to drive safely and competently and providing them with the skills to become safe confident and proficient drivers ready to pass the current driving test. I am a client focussed instructor and am delighted to tailor all training to suit individual needs and learning requirements I am patient friendly professional and provide a safe and fun environment in which to learn.